Rubio Long Snapping traveled to TX on December 13th for their fall camp. The camp had the most talent, from top to bottom, of any Texas camp I have ever had in the last ten years. Long Snappers came out from TX, KS, LA, CO, AZ, OH, MO, PA, MI, OK, AR, NM and even CA to learn from the best and get the most exposure possible for Long Snapping. The overall winner of the camp was EVENT ELITE member Travis Arroyo (TX, ’16). Travis is a massive Long Snapper with great athleticism, good flexibility and great form. Wonderful attitude and demeanor as well. So large and powerful that he might be able to play two positions in college as he is quite the dominant lineman. Geron Eatherly was the best 2016 Long Snapper in attendance. He is BEYOND smooth and accurate. ALWAYS is either in the finals or right next to them. Very accurate and he is gaining some good size. He will be a great pickup for a college coach. Dylan Alexander was VERY impressive in TX. Long time Rubio Long Snapper that has really improved over the past year. Was snapping in the .6s. Looking very solid right now. Alex Edwards continues to move up the ladder and get better. Power is solid and he is built thick. Kolin Hayes showed very good accuracy and poise. Conner Hemphill has some of the quickest hands in the country. Lots of potential. James Kozachenkzo can snap the ball with great power and accuracy. CONSISTENCY will be the next hurdle. Watch him. Gabe Skrobot keeps doing his thing and moving right along. Unlimited potential on the Skrobot. Thomas Fletcher left no doubt he is the best 2017 Long Snapper in the country. He handles pressure as well as anyone I have ever had and has ZERO wasted movement when he snaps the ball. Efficiency of his snapping motion is off the charts. Kid is ready for college right now. Jeremiah Riordan is really moving up the ladder lately. You can tell he has been working on his overall form. Looking very solid. I would be VERY surprised to see him not dominate VEGAS XXVII. Jake Pagel is just a flat out machine with his snapping. He is always great and just keeps getting better. Silent assassin. Drew Wise has TONS of upside and can get the ball moving quickly back to the punter. Watch him closely at VEGAS XXVII. Zach Edwards made a very strong case to be the #1 Long Snapper for the country in his class. Body is coming along nicely and he has tremendous form. Kid can rip the ball back to the punter. Doesn’t say much, but doesn’t need to. I am very interested to see how he does in VEGAS with a little more pressure thrown at him. Randen Platter was VERY accurate and handled pressure well. Solid frame that will be able to hold more weight. Good kid. Joseph Ramos is a massive man with great form and power. Tons of upside and definitely one to watch. Hayden Hood was the best 2019 Long Snapper in attendance. 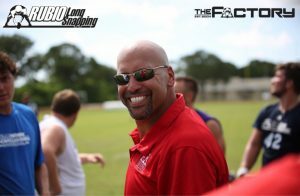 He has been working with Rubio Long Snapping staff member John Finch and it was apparent that the lessons have paid off. Kid is athletic and has a great, blasé attitude that makes him handle pressure well. TONS of upside. Luke Rizzo came out of nowhere and showed me some great things. Very impressive first camp for him. Watch him over the years. Dominic Serapiglia has good form and a great attitude. Increasing his strength will help as we progress. My rankings are NOT done from some mathematical formula. My rankings are based off of this blog I wrote about what makes a Long Snapper great. If you would like anything added to your profile page, simply email me (Rubio@RubioLongSnapping.com) the information and consider it done. All Long Snappers are ranked after their first fall camp of their freshman year in high school. For the profiles section, simply go to RubioLongSnapping.com. click PLAYER PROFILES, click which class, click LONG SNAPPERS and find your name.